Home Entertainment News Bollywood News Bollywood actress Alia Bhatt's Favourite Photographer 'RK' Strikes Again! Along with 'Brahmastra', the actress will be seen in 'Gully Boy' and 'Kalank'. Bollywood actress Alia Bhatt's recent string of Instagram pictures tells us that the rumored couple, Ranbir Kapoor and Alia Bhatt don't require anything else, except each other's company. The duo is currently shooting the second schedule of the upcoming supernatural thriller 'Brahmastra' in Bulgaria and even though the two seem to be quite busy, they still take some time out to click a few pictures of each other. Recently, the actress took to the photo-sharing app, Instagram and posted a picture taken by her favourite photographer 'RK'. 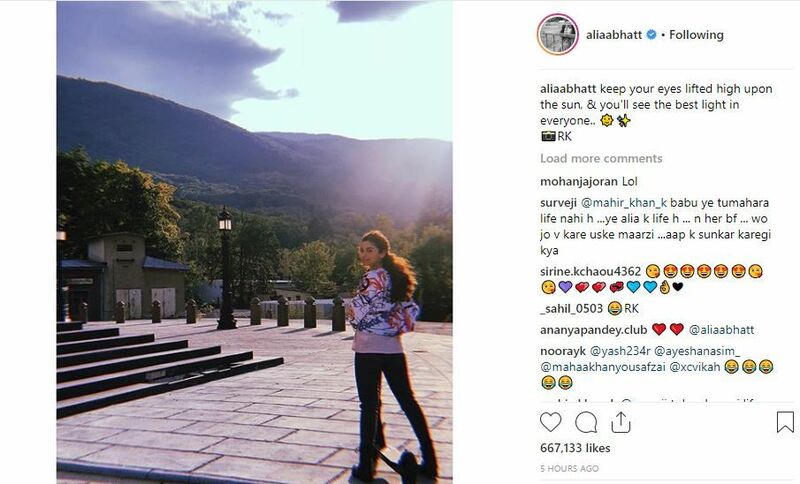 In the picture, Alia can be striking a pose in front of the camera, and in the backdrop, a picturesque Bulgaria can be seen. The post has been captioned as "Keep your eyes lifted high upon the sun, & you'll see the best light in everyone.. 🌞✨📸RK"
This is not the first time, but the fourth instance that the actress has shared a picture that has been clicked by Ranbir Kapoor. Earlier, an adorable selfie of the rumoured couple was doing rounds on social media. However, the highlight of the picture is the unmissable grin and pout donned by Ranbir Kapoor and Alia Bhatt. Ever since the two have started shooting for 'Brahmastra' in Bulgaria, the two have been in the news for their alleged closeness. As speculations are rife that something is definitely brewing between the two, nothing is confirmed yet! Although, on one occasion, Bollywood actor Ranbir Kapoor did hint at their alleged relationship, and the two have been spotted at various occasions dining out with each other's families and appearing to be all cozy. The supernatural thriller 'Brahmastra' is helmed by Ayan Mukerji and reportedly, actor Ranbir Kapoor will be seen performing different forms of martial arts in the film. Along with Kapoor, the film also stars Alia Bhatt, Amitabh Bachchan, Mouni Roy and Nagarjuna Akkineni in pivotal roles. As for Alia Bhatt, she is currently basking the success of 'Raazi' that minted around 200 crores worldwide. The actress will next be seen opposite Ranveer Singh in Zoya Akhtar's 'Gully Boy' and 'Kalank' that is slated to release in 2019. Read: , Alia Bhatt Kapoor Hota Hai's Sequel To Star Ranbir Kuch Kuch'And Janhvi Kapoor? 'Kuch Kuch Hota Hai's Sequel To Star Ranbir Kapoor, Alia Bhatt And Janhvi Kapoor?